The Immortal Rules by Julie Kagawa is out today, and I'm lucky enough to have her amazing editor here on the blog to talk about Julie, her books, and the editing process! Harlequin TEEN was also generous enough to offer me a copy of The Immortal Rules to give away, so be sure to read all the way to the end and enter. Bio: Natashya holds a B.S. in animal science from the University of California, Davis, and an M.A. in magazine journalism from the S. I. Newhouse School at Syracuse University. She began working at Harlequin as an editorial assistant in 1996. 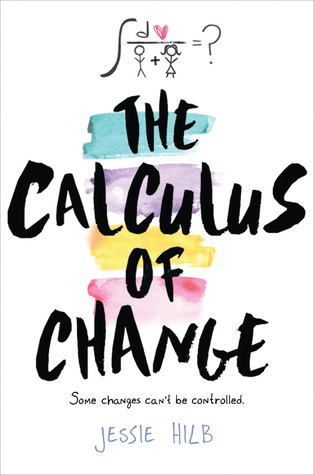 She left in 2000 to work first as an associate editor for McGraw-Hill and then later for the Rosen Publishing Group, where she edited children’s nonfiction books. She returned to Harlequin in 2004 and later became the senior editor for Harlequin TEEN. Hello everyone. I’m Natashya Wilson, the senior editor for the Harlequin TEEN program. Thanks so much for having me here to post as part of The Immortal Rules blog tour. I have the privilege of working with Julie Kagawa, and this book has been one of my favorites to edit. I’m excited to tell everyone a little more about the process. Years ago when we first acquired Julie Kagawa’s Iron Fey trilogy for Harlequin TEEN, I knew we’d found a unique author with an outstanding and cinematic story telling style. I sound a bit gushy, I know, but it’s true. 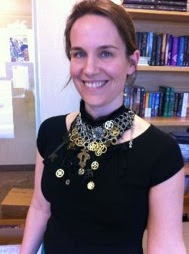 Julie wound up writing a fourth book in that series—um, I might have encouraged that just a bit, but that’s another tale—but even then Blood of Eden was working its way through Julie’s creative mind, and we contracted a new “dark fantasy” trilogy, not quite knowing what it would become. Julie’s agent, Laurie McLean, began describing Julie’s fledgling idea to me and we got to thinking, hmm, could vampires work in a future dystopian world? Laurie took that to Julie, and soon book one of the Blood of Eden series, The Immortal Rules, was on its way. I was eager to see what Julie would do with a new world, one so different from her bestselling faery series, and when the manuscript came in, it surpassed even my high expectations (see? Gushy. And still entirely true.). I sent her my notes and we talked over Julie’s ideas for refining the story, and did a round of edits before the final ms was ready for production. I hope you’ll enjoy the results as much as I did. 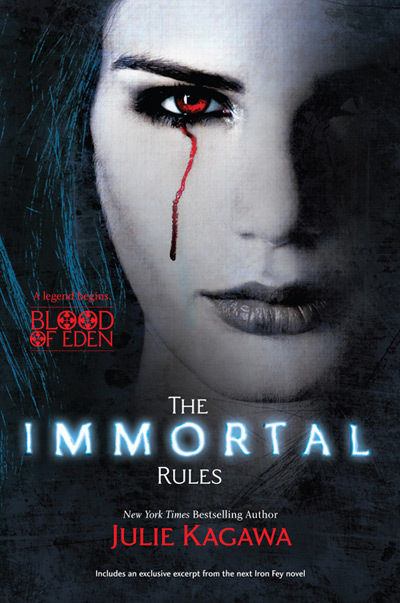 The Immortal Rules is darker, edgier and just as action-driven as the Iron Fey books but with a human girl, Allison Sekemoto, making a different choice—die, or become one of the vampire monsters she loathes. The way Julie approached the scenario creates a question that will resonate universally—what does it mean to be human, and what makes someone a monster? You decide. Please let us know what you think! You can find us on Twitter @HarlequinTEEN and on Facebook. Thank you for following The Immortal Rules blog tour! Please visit http://www.tyngasreviews.com/ for the next stop on The Immortal Rules blog tour. Sounds like an awesome read!!! Thank you for sharing! !